Q: Cap’n Shayna, when did you first get interested in pirates? A: Well, I started many lifetimes ago as a Washerwoman at Southern California Pleasure Faire, so I always knew a subculture was there. I took a left turn in 1978 or so when I heard my first Ramones song and went in a different direction; it wasn’t until I went to a pirate themed wedding that I realized that the subculture was still there. Since I’m too punk rock for Renaissance, Pirate fits me perfectly. Q: You offer a lot of different styles of pirates for both men and women. What are some of your favorite items and why? A: Well, the ones I’ve designed that have my label are my favorites, but if you set that aside, I’d say the Pro Series Shirts. They are the ones the performers use because the material and construction stand up to multiple wearings and washings very well. Q: How difficult is it to get out of the Eighteenth Century Handcuffs? A: I don’t know. Let’s ask customer Janice K. that emailed me with lots of typos the other day asking if I sell spare keys. Q: Do you have any advice for women who are thinking about getting a corset but have never worn one before? A: Sure. First, keep in mind that bodices lace in the front, but corsets lace in the back. If you have no one to lace you up in back, get a bodice. Second, if you are uncomfortable, you’re doing it wrong. All that steel boning is meant to not only hold you in, but it should also hold you up. In other words, it assists your core in holding up your torso, so it should feel great when you take it off not just because you can breathe again, but also because your core hasn’t had to work so hard to hold you up. Third, and you can all say it with me; “boots before bodice”. Get the bending over things done before you cinch in. Q: Do you get any special requests for garments? and if so, what are some of the more outlandish requests? A: I do. Tons of people think I’m here sewing away, and will ask for something in a different material or color than what we make. Most outlandish requests are from fetish people who like to call and ask for things and see if I freak out or not; like talking about the bloomers or pantalettes for large men. Thanks for your time Cap’n Shayna – we know that Halloween is a very busy time for you! 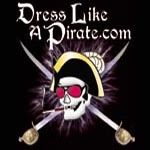 Stop by www.DressLikeAPirate.com to find the perfect piratical clothing and accessories for your look! Previous PostPrevious Pirate Myths – that are true!